For those of us who have been involved in Campus Archaeology for a while, it is hard to believe that it has already been almost a decade since the first MSU excavation occurred. In honor of this, we are beginning the 2015 year by looking back at some of the major finds and events for the program! In 2005, MSU was celebrating its sesquicentennial, its 150th year that it was a university. As part of this celebration, Dr. Lynne Goldstein proposed the excavation of the first dormitory on MSU’s campus. Saints’ Rest was built in 1856, but burned down in 1870 over winter break. Since its demolition, the site had remained open grass and sidewalks, marked only by a small cornerstone. Research into the site revealed that there was a chance that the foundations of the building were still there, and that we could learn more about this early era of campus life. The Saints’ Rest excavation took place in June 2005, and over six weeks, the archaeological team discovered foundation walls, a sand floor and cobblestone floor basement, original stoves that heated the dorm, barrels and buckets of building materials used to maintain the dorm, and dozens of historic artifacts like ceramics, bottles and more. It was a highly successful dig that demonstrated the importance of conducting archaeology on MSU’s campus. With the importance of conducting archaeological work demonstrated to the university, Campus Archaeology began as a small program dedicated to the protection and mitigation of MSU’s archaeological resources. The goal wasn’t just to excavate known sites, it was also to work with construction crews to prevent destruction of the archaeological record everywhere on campus, as well as to educate the campus community about the importance of these resources in learning more about our university. The foundation of College Hall. Photo courtesy of University Relations. 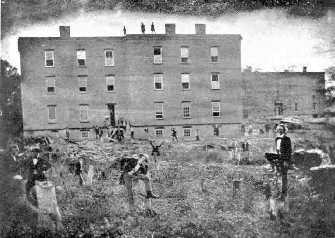 College Hall was the first academic building on MSU’s campus, and after it came down in 1918, its foundations were used to create an Artillery Garage. This didn’t sit well with alumni who had fond memories of this important and historic building, so money was donated to create Beaumont Tower. In 2008, when construction was being completed to update the sidewalks around the tower, Campus Archaeology got the opportunity to find the foundations of College Hall, still beneath Beaumont Tower. During 2010 and 2011, the MSU Campus Archaeology program had its first archaeological field schools on campus. These field schools gave students the opportunity to do archaeology in their own backyard, and learn archaeological methods without having to travel too far. The field schools revealed a lot of new information about the area within West Circle Drive known as the Sacred Space. They located some of the earliest sidewalks, and found a major trash deposit on what would have been the banks of the old river that used to run through campus. 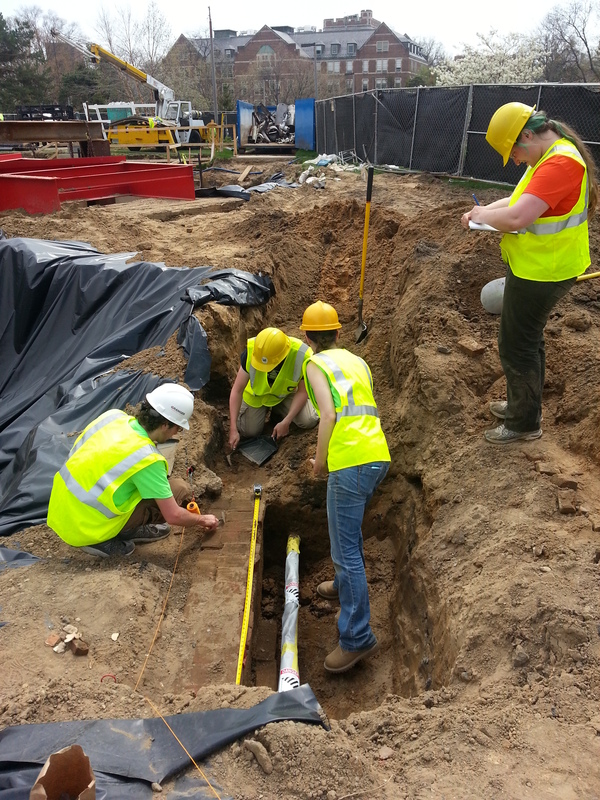 Most important, in 2011, members of the field school discovered the first prehistoric site on campus. While we had found some evidence of prehistoric peoples, it was limited to a few flakes and small stone tools. In 2011, an actual prehistoric fire pit and site was discovered. Over the past few years, we’ve made more exciting discoveries, like finding a building that wasn’t on any of the historic MSU maps below East Circle Drive. This building turned out to be a boiler building that provided heat to Morrill Hall and a dairy building when it was first erected in 1900. The boiler was only in use for a couple years, and then was torn down when a newer heating system went into place on campus. The building was forgotten until construction crews revealed it in 2012 digging up the old road to replace the steam tunnels. Another exciting find was last summer, when our archaeologists found the foundation walls of the first Vet Lab under West Circle Drive. The team discovered foundations to the building, as well as some really cool artifacts like keys and metal labels for specimens, as well as animal bones. 2015 and Beyond: Third Field School and More! This upcoming summer, we are very excited that we will be having the third MSU Campus Archaeology field school, which will teach students proper excavation techniques and archaeological methods on campus. It is an exciting opportunity to excavate our campus and learn more about how our university developed and changed over time. In the past decade, Campus Archaeology has done a lot to improve our understanding of the development of MSU, and it is exciting to look ahead- imagine how much more we’ll learn about MSU in the next decade!